Dean, a musician with a band and an album that was just released, contacted BsnTech Networks a few months ago regarding the completion of a website. Dean worked with another website designer that didn’t understand or grasp the concept that he wanted on his website. Dean wanted to have a website where a random background image was displayed. The other designer kept creating a website that had a slideshow with rotating images – which is not what Dean wanted. He simply wanted a very basic website that had random background images with each page load. The site was very simple – only two pages with some buttons. Dean got very busy and had to work with his studio to get the album completed. This delayed the design project by a few months. However, we had the majority of the site done within a day after Dean paid the initial payment to get started on the site. Upon getting the album added to CD Baby, iTunes, and Amazon, he gave us the needed codes and we finished the site up. His website is now fully published and is ready for visitors. Dean noted in an e-mail “There will be [more business] I guarantee it…updates and another project in the future. Seriously, you were crazy fast. Thanks!”. We appreciate the business from Dean and look forward to other projects from him! 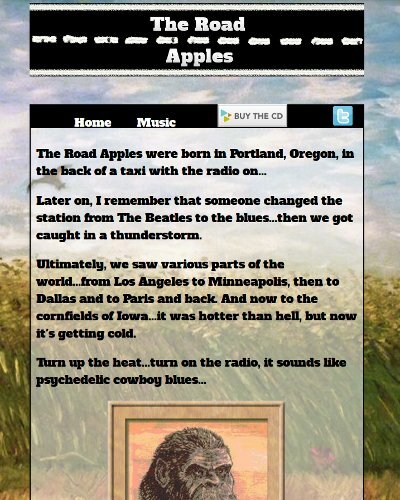 Dean’s website is at theroadapples.net.